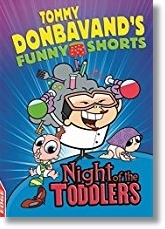 I'm sure that you're already familiar with many of Tommy Donbavand's books - including his popular Scream Street series, but did you know he has Funny Shorts? If not, then you're missing a treat. 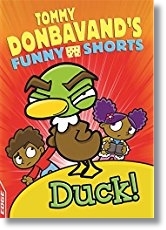 Published by Franklin Watts in their Edge series, Tommy Donbavand's Funny Shorts are perfect for reluctant young readers and they nicely bridge a gap between reading schemes and bigger chapter books, (usefully for teachers and parents, each book has a book band noted on the back). Each book consists of up 62 pages divided into 4 to 7 chapters. 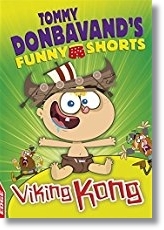 All of the books are funny and well written (as you would expect from Tommy - he certainly knows what he's doing) there are some double pages of text but most pages contain bright, cartoon style illustrations. When old age pensioners, Norah and Tom, throw bread to the ducks they don't have any idea what they are about to set into motion. It isn't normal bread they are throwing... containing 'Omega 33' this is 'Bread To Make You Brainy. Most of the bread gets eaten by a big drake with a funny little moustache who uses a stick to fend off the other hungry ducks. While Tom and Norah make their way home, there is no one there to see the Drake step out of the water and smile as he surveys the human world. Six months later, there are posters of Drake hanging in every street and the whole country has been taken over by his feathery army who 'duck step' along the road. Human slaves are forced to work in Drake's factory where they make more of the Omega 33 bread for the ducks. It's down to Jasmine and Luke Viccars, and a small human resistance force to save the day. But can they put 'Operation Bake-Off' into action and triumph over Drake and his feathered army, or will the ducks and the 'Mallard Youth' stop them? 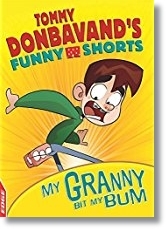 Everyone knows what happens when you get bitten by a werewolf, but nothing could have prepared Billy for what would happen to him after being bitten on the bum by his Granny's flying false teeth. Walking to school with his friend the next morning, Billy goes through an unexpected change. His spine twists and bends forward, his hair changes colour and even his clothes change. One minute he's wearing his school uniform and the next he's dressed as an old woman and carrying a huge handbag. Not only does Billy look like a granny but he talks and acts like one too. It doesn't take Billy and his friend long to realise that he's turned into a were-granny, though they have no idea what triggers the change or when it will happen. Read on to find out what happens when Billy turns into a were-granny in his classroom and how he stands up to a couple of thugs determined to steal money form the local post office. 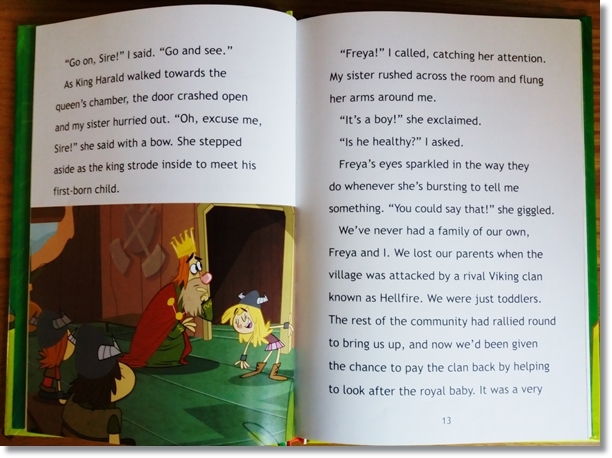 While young Erik sits with King Harald, his twin sister, Freya, is with Queen Ingrid as she shouts and curses during the birth of the royal baby. When the baby is born, King Harald proudly presents him and announces that he is Prince Olaf - future leader of the Poowiff Clan - then he and the baby crash through the wooden floor. Prince Olaf is a huge baby. He drinks milk straight from the cow. He is too big to fit inside the village huts and on his second birthday he is given a full sized Viking longboat to play with as he sits in the bay. Nappy changes are a huge and terrible job, but when Olaf blows out the flaming tree candles on his birthday cake and sets the entire village on fire the elders decide that Prince Olaf is too dangerous to have around. Before Olaf is banished from the village, Erik and Freya step in and take him away - intending to look after and protect him. Things don't quite go according to plan though and when Erik and his sister wake up one morning to find baby Olaf missing they know there is only one place he could have gone... Home! But what will happen when Olaf gets there? Professor Nigella Troppy has invented an amazing cream that, when rubbed on the skin, makes the user younger. Testing a little drop on herself she changes from a 59 year old woman to a glamorous 20 year old. Nigella is sure that all her hard work will get her promoted to Chief Scientist but she's furious to learn that her rival, Professor Fanton Smooth, has been promoted instead. As revenge, she gives Fanton a huge dose of the 'Born Again cream' which turns him into a toddler. When Bobby Savage and his sister Gail see Professor Troppy selling the amazing cream on a market stall they think it will make the perfect gift for Mum's birthday. Mum isn't impressed with the cream, or with anything else about her children it seems, but she spreads a dollop of cream onto her arm before going back to the party with her obnoxious husband and their friends. The twins are left to fend for themselves and go to bed with some toast. Despite the loud music from downstairs they fall asleep, only to be woken later by the sound of a baby crying. Going into the front room they find their parents and their friends have been turned into toddlers. As if this isn't bad enough, Bobby and Gail to discover that the effects of the cream have spread as far as Buckingham Palace and the Royal Family. Is there any way of reversing the effects of the cream or will Nigella Troppy really be the new Queen of England. These four titles have been out for a little while now but keep your eyes open for new titles coming soon - Invasion of Badger's Bottom, The Curious Case of the Panicky Parrot, The Dinner Ladies of Doom! and There's a Time Portal in my Pants!